click: Place 1 power counter on MCA Austerity Policy. When the Runner's next turn begins, he or she loses click. Use this ability only once per turn. click,trash, 3 hosted power counters: Gain click,click,click,click. Can the Corp use the second ability on MCA Austerity Policy on the same turn the third power counter is placed on it? Yes. Only the first ability is limited to once per turn. MCA Austerity Policy (MCAAP) is a new, oppressive addition to HB's fast advance arsenal. On the face of it, MCAAP gives a strong fast advance ability that has to be powered up. After rezzing and using its first ability twice (over two turns), the corp is left with the possibility to score a 4/x from hand on the third turn or a 5/x on the fourth. This in effect puts the runner on a timer from the moment the ability is first used, having two turns of 3 each to respond to the threat of a big agenda being scored from hand. For just 1, that's amazingly good value for the corp.
As the astute observer might note, this means MCAAP benefits from being installed behind some taxing ice- most sane runners will be all too happy to pay the 3 investment it takes to collapse austerity if it's installed naked. 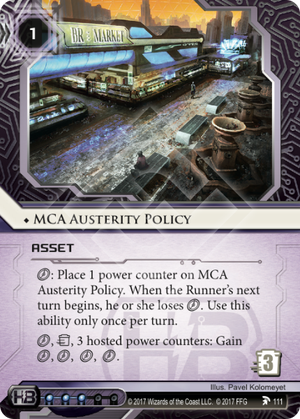 Moreover, even if the austerity policy is well protected, the corp still has to consider that plopping this card on the board is a big advertisement for the runner to hit your HQ hard in search of that juicy agenda you're itching to score. The key to getting the most out of MCAAP is to use it to force the runner into lose-lose scenarios. When installed in a taxing server, it provides the runner with a dilemma- either hitting the server now, trashing MCAAP but potentially spending all their in the process, or let the corp power it up and score agendas from hand- in this case either option will open up a scoring window. Any time the runner spends resources on hitting protected servers to trash assets is a tempo swing in favour of the corp, and this is exactly the thematic beauty of MCAAP. It demands a response much like a rezzed SanSan City Grid or Mumbad Construction Co. does, but with a far more favourable rez-to-trash ratio for the corp. If there's one comparison to make, it's probably with the latter card- think of MCAAP as a cheaper version of MCC that eats instead of . Rushing MCAAP behind a Fairchild 3.0 is really potent when the runner hasn't found their decoder yet, because they won't be able to click through its subroutines after losing a to MCAAP. If you can stick the trace for Hard-Hitting News, the runner will be stuck with four tags and three with which to clear them. This can open a window for resource trashing or tag-combo cards, and offers a great way to keep the runner busy and poor while you charge your policy up. Enhanced Login Protocol punishes the runner for making the runs they need to counter MCAAP, taxing already sparse clicks. If you're looking for jank, you can use Victoria Jenkins and Load Testing to rob even more and punish them further with Ryon Knight. Fast Track will let you retrieve the agenda you need when you're ready to fire MCAAP's ability. Combo with Whampoa Reclamation if the agenda happens to be lying in your archives. With Jeeves Model Bioroids on the table, you can score a 5/3 on the third turn rather than fourth (or something crazy like a Vanity Project on turn four). Other FA tools will combo for the same effect, but Jeeves is the most efficient since it takes advantage of your having plentiful to power its ability. At its core MCA Austerity Policy (MCAAP) is way to move clicks between turns, setting you up to score a 5/3 after three turns of charging. The main problem of MCAAP is that you're putting up a big neon sign saying "in 3 turns I'm going to score a 5/3". To compensate for this rather major weakness MCAAP lets you drain the runner's clicks by one while you charge it. However I do not believe that in practice this will be a great help. Yes, with MCAAP and the usual HB gang of slowdown cards you can make life harder for the runner. However you still need to keep MCAAP on the board for 3 turns. Sure, you can install it in a scoring remote and the runner will not gain anything directly from trashing it but there are a few secondary effects that will make life difficult for you. If you install MCAAP while you don't have the agenda to be scored handy you run extra risk of the runner getting in and trashing MCAAP, costing you clicks that are even more precious for the corp than for the runner. The runner will assume you do have an agenda in your hand and thus run HQ aggressively. While you charge MCAAP you only have two clicks left which makes dealing with agenda flood even harder. And remember Jackson is rotating out. MCAAP creates a window in which the expected density of HQ is higher while your ability to deal with the runner is lower. The only way to compensate for that is to have a very good defense. To make the most out of the 3 click turn of the runner that probably means cards like Mason Bellamy and bioroids. Still, you should expect a good runner to get into your servers once a turn. @Snowscoran's review goes into how you can compensate for the weakness of MCAAP and it might well be that I'm too pessimistic, but I see MCAAP as an attractive way to shoot yourself in the foot unless you really know what you're doing. Importing MCAAP into Weyland can be tough at 3 influence, and getting Helium-3 on the board and ready to score at the right time is even jankier, but who am I if not a lover of jank? As I've already noted on the review I did on the page for Helium-3 regarding this very combo-wombo, it's hard but not impossible. Other people on this page have already noted that the runner will be expecting HQ to hold the agenda you want to fast-advance, so why would they bother going in for a IAA remote that's probably a trap? tl;dr - Helium-3 was made for this card, yo. Yes, causality itself has inverted in order to point out how amazing this jank would be if you pulled it off.